Nearly a quarter million Arizonans who dropped off their early ballots at polling places on Election Day in November would lose that ability in future years under a bill that passed its first legislative hurdle in a Senate committee on Thursday. The Senate Judiciary Committee passed three election-related bills sponsored by Sen. Michelle Ugenti-Rita, R-Scottsdale. One of those bills, Senate Bill 1046, would require voters who receive early ballots in the mail to return them only by mail, rather than bringing them to polling places before or on Election Day. People who don’t mail in their ballots would be able to vote at a polling place, but would have to wait in line and go through the same process as other in-person voters. The committee passed SB1046 on a 4-3 party-line vote, with Republicans supporting it and Democrats in opposition. Under the current system, early ballots that are dropped off on Election Day are among the last to be counted, which can be a lengthy process as election officials verify voters’ signatures on their early ballot envelopes. After the November election, it took county election officials nearly two weeks to count the votes, during which time Democrats took the lead in several high-profile statewide races in which they’d trailed at the end of Election Day. Ugenti-Rita said SB1046 will provide more timely results, eliminate confusion about early voting and reinforce that Arizona’s vote-by-mail system is, in fact, conducted through the mail as intended. According to the Secretary of State’s Office, about 228,000 voters dropped off early ballots on Election Day across the state. That figure doesn’t include voters who dropped off their early ballots prior to Election Day, because election officials count them with other early ballots that arrive in the mail. Thirty-seven percent of those voters were Republicans, 34 percent were Democrats and 29 percent were independents or other parties. Of the more than 1.5 million Arizonans who cast early ballots in November, about 42 percent were Republican and 33 percent were Democrats. Public testimony in the packed hearing room was overwhelming against the proposal, with election officials from both major parties, voting rights advocates and other activists calling it a solution in search of a problem. Opponents said many voters prefer to hold onto their early ballots to give themselves the maximum amount of time to make their decisions. Some opponents called the bill a form of voter suppression. Some argued that banning people from dropping off their early ballots in person wouldn’t actually result in faster vote counts. Jennifer Marson, executive director of the Arizona Association of Counties, said most early voters either mail in their ballots shortly after receiving them, or wait until the deadline on the Wednesday before the election. She said the people who drop off their ballots on Election Day will instead send them on or near the deadline, and as a result, SB1046 would not result in faster vote counts. Rivko Knox, of the League of Women Voters of Arizona, said election results didn’t take any longer in 2018 than they did in previous elections. There only difference between 2018 and other elections is that there were close races, she said. Sen. Eddie Farnsworth, R-Gilbert, the committee’s chairman, said that issue could be addressed by moving up the deadline for mailing in ballots, perhaps up to 10 days before the election, so that counties have more time to count. Ugenti-Rita said she’s open to such an amendment. 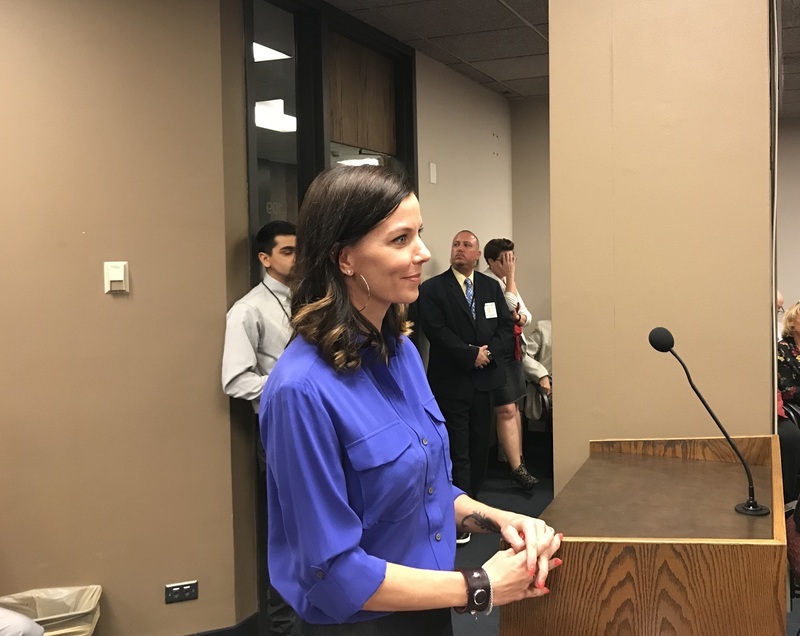 Representatives of Secretary of State Katie Hobbs and Maricopa County Recorder Adrian Fontes, both Democrats, voiced their offices’ opposition to the bill. But one of the most strident voices against SB1046 came from a Republican election official. Yavapai County Recorder Leslie Hoffman said she doesn’t believe SB1046 will make vote-counts faster, except possibly by virtue of reducing voter turnout. She touted Yavapai County, a Republican stronghold, as having the highest percentage of voting-by-mail in the state, and urged the committee not to take away an option that many voters use. “Please don’t take that away from me, my county, my taxpayers,” Hoffman said. Republican members of the committee pushed back against criticism that SB1046 would result in voter suppression. Farnsworth said people who drop off their early ballots in person are actually making things less convenient because they have to drive to the polling place to drop it off. He noted that people who drop off early ballots don’t have to wait in line like other voters do. Ugenti-Rita said some simply want the “I voted” sticker they get at the polling places, or want the experience of going to the polling place in person while still using an early ballot. Ugenti-Rita dismissed the county recorders’ criticism. Ugenti-Rita told the Arizona Mirror after the hearing that she sponsored SB1046 in response to concerns she heard from constituents about the length of time it takes to count ballots, and said people want more timely results. The committee on Thursday passed two other Ugenti-Rita bills related to elections. Senate Bill 1072, which would require people who vote early at polling places and voting centers to provide photo identification, as other in-person voters do. Currently, people who cast early ballots in person must only sign a ballot envelope, and election officials check their signatures against a database to verify their identity, which is the same process used for mailed ballots. The committee passed SB1072 4-3 on a party-line vote. Ugenti-Rita said she is trying to create uniformity in voter identification requirements. Another of Ugenti-Rita’s proposals, Senate Bill 1054, passed unanimously. The bill would give counties a mandatory five business days after an election to verify the signatures on early ballots, a process known as “curing,” if the signatures are illegible, don’t match voters’ signatures that are on file, or are otherwise questionable. Critics who opposed Ugenti-Rita’s other bills in the Senate Judiciary Committee praised her for SB1054. Several speakers told the committee that such a change is necessary because some voters’ signatures change over time, or temporarily as a result of injuries, prescription drugs or other issues. “It’s a positive step toward allowing all voters to be heard,” Knox said. Counties reach out to voters to verify questionable signatures on ballots that are received prior to Election Day. But until November, most didn’t do so for ballots received on the day of the election. All 15 counties agreed to cure such ballots after Election Day in a settlement of a lawsuit brought by several county GOP organizations. Regarding SB1046, if, as Ugenti-Rita says, people want more timely results, then the Recorders should be funded and staffed to achieve that. But according to the Recorders, the Sec’y of State, and the Association of Counties there is no crisis. Thus there is NO good reason to cut off an important means (for nearly a quarter-million citizens!) of getting ballots in the box. A means to vote is a freedom and freedoms should not be taken away unless absolutely necessary. Ugenti-Rita has not shown that. I’m a native Arizonan living in the Pacific NW. Oregon and Washington conduct vote by mail.. and count ballots as they come in.. and holding the disclosure of results until 8pm. Arizona could do this. This approch largely avoids the specter of delayed results. Exercising the franchise greatly outweighs any pleasure standing in line at a polling place or getting an “I voted” sticker. The comparison isn’t close. how do I find out if the name I put on my early ballot exactly matches what the county has on file? is it supposed to match what I have on my drivers’ license? I usually don’t use my middle name in my signature but I think my DL has the middle name written out fully. does that mean my vote was tossed because I just put my middle initial on that signature on the ballot? Delivering the ballots directly to the local ROV is the only way I can ensure my ballot won’t get “lost” in the mail or otherwise. This is a dangerous move by Senator Michelle Ugenti-Rita and is a clear move to disenfranchise a large segment of the voting population. My only hope is that it doesn’t pass fully and that voters will be able to continue with a tradition that has benefitted so many voters for so long! Agreed. If the reason of that bill is to make certain that the election results are not delayed, they can always add resources to the recorder’s office. Great reporting. I was in attendance and you summarized this very well. Thank you. Good- it makes a mess of things. Everyone I know that gets “early ballots” forgets about them and ends up dropping them off at polling places or doesn’t vote altogether. Let’s make it mandatory for MOST to get up and get out the door to vote. I don’t like to use names or snide comments, but this is the stupidest law that doesn’t really solve a problem. It will not speed up the vote counting process. Mail in ballots will still required the same verification. This is just another attempt to make voting more inconvenient. Instead we should move to automatically registration when getting a State ID or drivers license. And have all voting by mail. Democracy needs more people voting. Make it as convenient as possible for EVERY citizen to vote. EVERY VOTE COUNTS. COUNT EVERY VOTE. TAKE AS LONG AS YOU NEED TO GET IT RIGHT. This Senate Bill is an attempt to suppress the vote and is an attack on our democracy.